I'm into porters and this one was pretty good. Nothing overly spectacular or even special, but solid. Good dark coloration, even though the foam has little life and no lacing to mention. Smell was on par with other porters - malty but this one had a hint of coffee in the background. Mouthfeel was smooth, lightly carbonated and just a pleasure to drink. I noted coffee as well in the taste and even hints of cinnamon and cocoa. Again, this wasn't anything I found to be best in class but certainly something I will look forward in the future. A good, solid, quality American-style porter. Solid, but not totally predictable. Malty in a most-pleasing way. The berry notes slither in a key of F sharp. L: Pours a dark brown amber color with a large creamy tan head and no lacing on the glass. S: Roasted malt and a nice earthy coffee, with a hint of bittersweet chocolate. Very inviting aroma. T: Sweet chocolate, a earthy and slightly fruity coffee, with some earthiness and maybe a little caramel. F: Medium to thick body with a creamy smooth mouthfeel. O: This is a very nice porter. Very deep amber color, brilliantly clear. Pours with a medium sized tan head, creamy and lingering. Malty sweet aroma with bits of caramel and chocolate. Subtle coffee and roast aroma, and also a bit smokey. Nice dark malt flavors up front, with some sweet chocolate notes and slightly smokey roast notes. Adequately bittered, and finishes somewhat dry and roasty, but don't get much of a hop flavor. Medium body and medium carbonation. No astringency or warming - nothing exceptional about the mouthfeel. A nice malt-forward beer. Very clean and drinkable. decent Porter, tastes nice and toasty but the feel and the smell don’t do much for me. Pours out cola brown and looks black in the glass. Topped by a thin beige head with medium-poor retention. Streaky lacing is left behind. Smells like malted milk balls, baking cocoa, dark chocolate, milk chocolate, roasted grains, burnt toast, black licorice and vanilla. Tastes like baking cocoa, dark chocolate, milk chocolate, malted milk balls, burnt toast, and roasted raw cereal grains. Some toffee and vanilla sweetness comes in near the finish, before finishing lightly bitter with pine and lingering burnt grains. Medium mouthfeel, well carbonated, perhaps a touch thin, but actually a decent mouthfeel for low abv porter. This is a solid, roasty/slightly smoky and chalky porter. It's a great if unremarkable beer. My overall impression is that I need to drink more plain ol' porters (and stouts and brown ales and...well, mainly those three). A: Pours dark brown, nearly black, with a frothy cocoa brown head that settles to a light layer and laces nicely. S: Roasted malt, a little smokey, dark bittersweet chocolate, coffee, a little pine, faint dark fruit, burnt sugar, and toffee sweetness. T: Roasted malt, coffee, dark chocolate, a little smoke, some pine, earthy, slightly nutty, faint herbal grassy notes, hints of dark fruit, and a little burnt sugar and toffee sweetness. M: Medium body, moderate carbonation. Dark berry porter taste, not my fav on this style. Pours a dark brown color. 1/4 inch head of a tan color. Decent retention and decent lacing. Smells of strong sweet malt, roasted malt, hint of spicy hops, hint of piney hops, and slight alcohol. 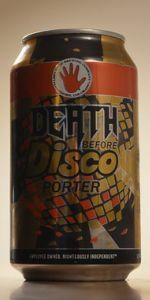 Fits the style of an American Porter. Mouth feel is smooth and clean, with an average carbonation level. There is also a noticeable bitterness. Tastes of strong sweet malt, roasted malt, hint of spicy hops, hint of piney hops, hint of chocolate, and slight alcohol. Overall, average appearance, aroma, but good body, blend, and feel. This beauty pours black with mahogany hues around the edges and a dense, creamy tan head. The nose is milk chocolate, some char, and a subtle fruity aroma. The fruity aroma comes forward on the taste as fruity berry flavors, which combine magnificently with the milk chocolate flavors. The mouthfeel is much more substantial than I’d expect in a 6% ABV beer. Truly a pleasure to drink. 12 oz can with a 19 Jan. 2018 BB date stamp, consumed in November 2018. Pours with a short, light tan head that reduces quickly and leaves scant lacing on the glass. The aroma is hoppy for style. So is the flavor but less so than the aroma. Spicy hops dominate up front but are joined, and eventually over-shadowed by dark roasted grain notes. Still, the hops continue all the way into the final aftertaste.